It’s almost BBQ season. And while buying a new bottle of ketchup isn’t such a big deal, the story behind the bottle is. For about two years, Heinz and French’s, two companies known for ketchup and mustard respectively, have been embroiled in a ketchup battle in grocery stores. Recently it’s been the customers who’ve been calling the shots using social media, but a brief timeline of events is necessary. The situation began in 2013 when the new owners of the H.J. Heinz plant in Leamington, Ontario decided to halt operations at the plant, put nearly 750 full time employees out of work and left some Ontario tomato farmers looking for a place to sell their crops; crops that are worth about $52 million annually. In 2014, Highbury Canco took possession of the plant. French’s, famous for its mustard, began selling ketchup in grocery stores. Heinz responded by selling its own brand of mustard. This is where social media comes in. 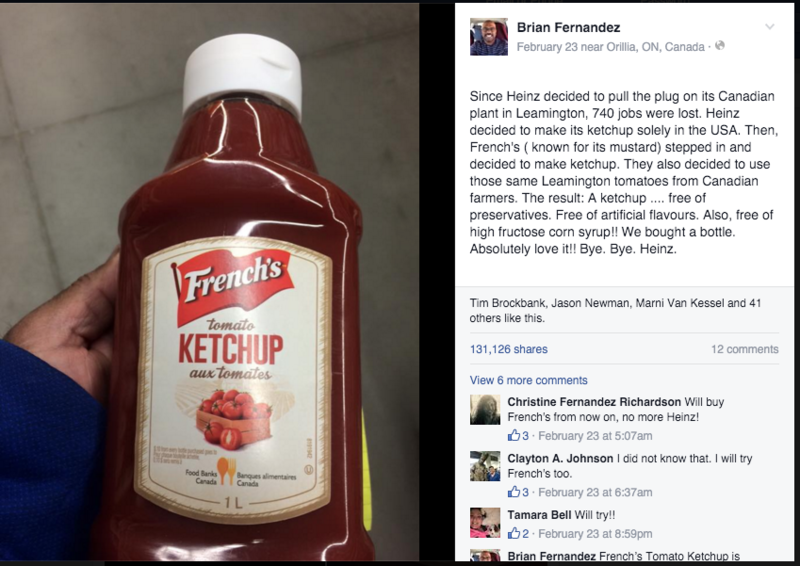 On Feb. 23, Brian Fernandez, a construction worker from Orillia, posted a photo to social media stating his family had switched from Heinz ketchup to French’s because of the company’s commitment to local farmers and its decision to stop using artificial flavours in the product. Last week, Loblaw, one of Canada’s largest companies, announced it was pulling French’s ketchup off its shelves due to low sales – and customers responded. An outpouring of messages encouraging others to boycott Heinz and Loblaw flooded social media. People took photos of themselves outside of Loblaw stores vowing to never shop there again and had the hashtag #Frenchsketchup trending on Twitter. Since then, Loblaw has changed its tune and will continue to carry French’s ketchup in its stores. Farms.com’s Media Team will continue updating this story as further events unfold.